The breezy calming eastland, maintained by the Windsinger and his children. Here exists a peaceful highland of steppes and fields, the terrain itself swaying to the tune of the endless plumes and currents of warm wind that caress the region. It is a world of rushed merriment, as dragons dive through and curl around gigantic clouds, racing one another through pockets of swirling cool air. The messages of the world all pass through this plateau, with each dragon traveling somewhere, and for some reason, guided only by the direction of the wind and a sense of exploration. The most peaceful place in all the world. Fledgling clans and families nestle within the bushes that line each grassy steppe, and calming breezes coax hatchlings to learn to fly much earlier in their life than other dragons. These plots of terrain physically embody the first chapters of each dragon's rite to become closer to the sky. 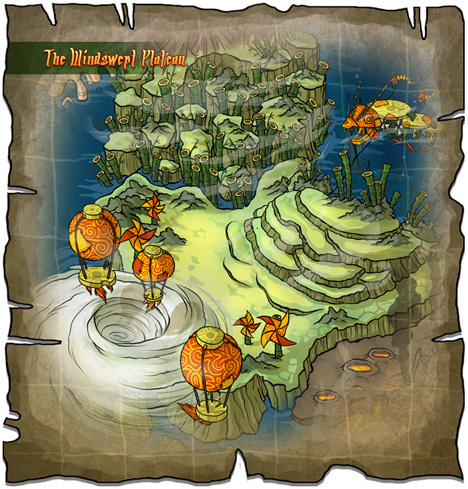 The bridging test of wind dragon's aptitude towards adulthood is the Ascent, a series of reed-covered cliffs through which the strongest of the region's air currents pass. Each pillar is higher than the one before it, creating the illusion of a fractured slope. These stairs are separated by open air, and rushing rapids can be seen far, far below. The final trial of the Windsinger's children is a powerful vortex on the western shore. This great storm has raged for thousands of years, and is said to be the residual effect of an ancient time in which the gods of air and ice quarreled. Torrents of angry air pull clouds in an aggressive spiral, and even the most adept wind dragons avoid the eye, a place from which many rarely return. A floating array of kites and platforms, crafted and maintained by the oldest clans in the region. Of the set, the largest kite resembles the Windsinger himself, his laughing visage constructed out of leather bladders and sturdy paper sails. Reed balconies and walkways connect each disc to the next, creating a giant slithering community in the sky.